(1) The Moon appears to move toward us, then away from us, as a result of the fact that its image gets bigger for half the cycle, then smaller for the other half. This is a real effect, caused by the fact that the Moon really does get closer to us as it moves from apogee to perigee, then further from us as it moves from perigee to apogee. The change in distance is about 6% either way, relative to its average distance, or almost 12% in the difference in distance from perigee to apogee (or vice-versa). As it gets closer to perigee it looks close to 12% larger in diameter and 25% larger in surface area than at apogee, and as it gets closer to apogee it looks close to 12% smaller in diameter and 25% smaller in surface area than at perigee. The average brightness per square degree of apparent size remains the same throughout this process, so the perigee moon also looks about 25% brighter than the apogee moon (see Pictures of the Moon for a comparison of the apparent sizes near perigee and apogee). Although in this animation, which simply repeats the same cycle of phases over and over, the part of the cycle of phases that represents perigee or apogee is the same, the fact that the Moon's cycle of phases is two days longer than its rotation rate (see Rotation Period and Day Length for a discussion of this sort of thing) means that the time when the Moon is closest or furthest from us gradually moves through the cycle of phases. Sometimes it is closest to us at new moon, sometimes at quarter moon, and sometimes at full moon. When perigee occurs near full moon the media run rampant with stories about a "super Moon"; but the Moon is actually just about the same distance from us at every perigee, no matter when it occurs in the cycle of phases. (2) Although the Moon always shows nearly the same side to us, there are small changes in what part of the Moon we can see due to librations in latitude and longitude (libration comes from the same root as the constellation Libra, the scales, and refers to the tendency of balance scales to bob up and down for a while, before settling into a steady position). The libration in latitude (north and south changes) is caused by the fact that the Moon's orbit around the Earth is tilted by about 5 degrees relative to our orbit around the Sun. This means that sometimes the North side of the Moon (on the top in this animation) tilts toward us (when the Moon is near the bottom of its orbit, and we can look "over its top", and sometimes the South side of the Moon (on the bottom in this animation) tilts toward us (when the Moon is near the top of its orbit, and we can look "under its bottom". Just as in the case of phases, the time when we can see "over the top" or "under the bottom" of the Moon changes from one cycle of phases to the next. Most of the change in when this occurs is due to the 2 day difference between the cycle of phases and the rotation period, but there is also a slow (once every 18 years) change in the orientation of the orbit of the Moon, so that at one time during the cycle we can see over the Northern edge of the Moon in January and the Southern edge in July, but 9 years later that is reversed, and another 9 years later things are back to where they were at the start of the 18 year period. This 18 year change in the orientation of the lunar orbit's tilt is also related to a change in the timing of solar and lunar eclipses, which over that 18 year period tend to gradually occur earlier and earlier in the year, averaging about 3 weeks earlier each year, compared to the year before. This leads to a predictable cycle of eclipses known as the saros, first noticed in Hellenic (ancient Greek) times. (3) The previous paragraph dealt primarily with the libration in latitude caused by the tilt of the Moon's orbit relative to ours. However, there is another libration (in longitude) caused by the fact that the rotation rate of the Moon is constant, but its orbital motion is not. As the Moon moves toward us (looking larger and larger as it moves from apogee to perigee) it moves around us faster and faster (as described by Kepler's Second Law of Planetary Motion, the Law of Areas). Since keeping the same side of the Moon toward us requires the orbital motion of the Moon to (on the average) be the same as its rotational motion, if the Moon is moving around us faster than usual the rotation can't keep up, and we get to see a little around the trailing (western) side of the Moon, which is shown on the right in the animation. (There can be some confusion here involving directions because the Moon is rotating around its axis from west to east, just like the Earth rotates on its axis, and orbiting us from west to east, just like the Earth orbits the Sun. For someone on the Moon east is to the right in this animation, just as it would be on a globe of the Earth. But since we are looking at the Moon in the opposite direction from the direction that someone on the Moon looks at the Earth, the eastern side of the Moon for a lunar inhabitant is on the western side of the Moon in our sky. As a result, old maps of the Moon label the right-hand side of the Moon as the western side, just as we see it in our sky; but modern maps, based on the idea that eventually we may once again have people working on the Moon (though since it has been over 40 years since the last man left the Moon I wouldn't hold my breath waiting for the next one), show the right-hand side of the Moon as the eastern side, the way that astronauts or whatever the next men on the Moon (lunatics?) happen to be called.) In any event, no matter what you call the right-hand side of the Moon (the western side as seen from the Earth or the eastern side for currently nonexistent lunar inhabitants), that is the side we get to look "around" when the Moon is moving faster than usual. As a result you can see (though with a little difficulty because even though I have considerably slowed this animation compared to the original, to give you more time to examine the changes) small changes in how far features on the western side are from the "limb" (or for us, the "western edge") of the Moon. In particular, Mare Crisium in the upper right part of the image gradually moves away from the limb as the lunar orbital motion speeds up (namely, as it moves toward us), then back toward the limb as the lunar motion slows down (namely, as it moves away from us). You cannot see all of this change because sometimes that part of the Moon is lit, and sometimes it is not lit, according to the current phase. Similarly, features near the (as we see it) eastern (or left-hand) "edge" of the Moon gradually move away from that limb as the Moon's orbital motion slows down (as it moves away from us) and we can look a little "around" that side of the Moon, then move back toward the limb as the Moon's orbital motions speeds up (as it moves toward us again). (4) The changes in the part of the Moon that we can see due to libration in longitude and latitude led fairly early on to the best maps of the Moon being printed as two nearly but not quite overlapping circles (as shown in a 1647 map by Hevelius, from his Selenographia). Where the circles overlap represents those parts of the Moon that we can always see (at least when they are lit up), and where they do not overlap represents those parts of the Moon only visible at the extremes of libration in longitude and/or latitude. The result is that we can always see (fairly well) 41% of the lunar surface, and at various times see (not as well, due to foreshortening near the limb) another 18% of the surface, leaving only 41% of the Moon's surface always on the "back" side and never visible from Earth. Below, Hevelius' map of the Moon, published in 1647 but according to a scroll held by cherubs in the upper left corner of the original plate, based on observations made in 1645. Note that West and East are shown here as seen from the Earth, and as labeled on (almost?) 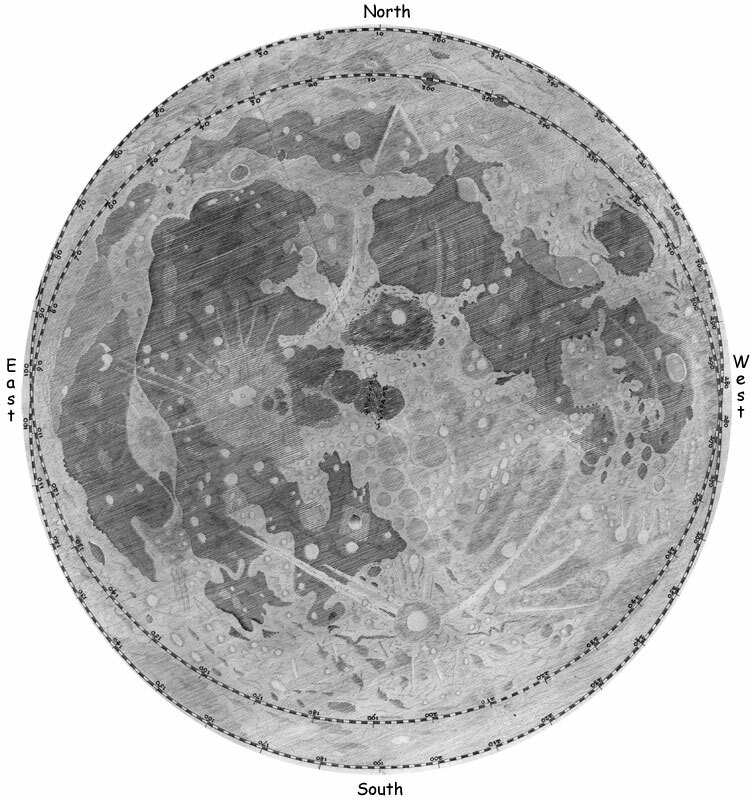 all maps of the Moon prior to the space age; post-space-age maps often reverse those directions so that they correspond to the view of someone living on the Moon. Also, to fit the image on this page I have cropped out the aforementioned cherubs and anything else outside the map of the Moon itself.